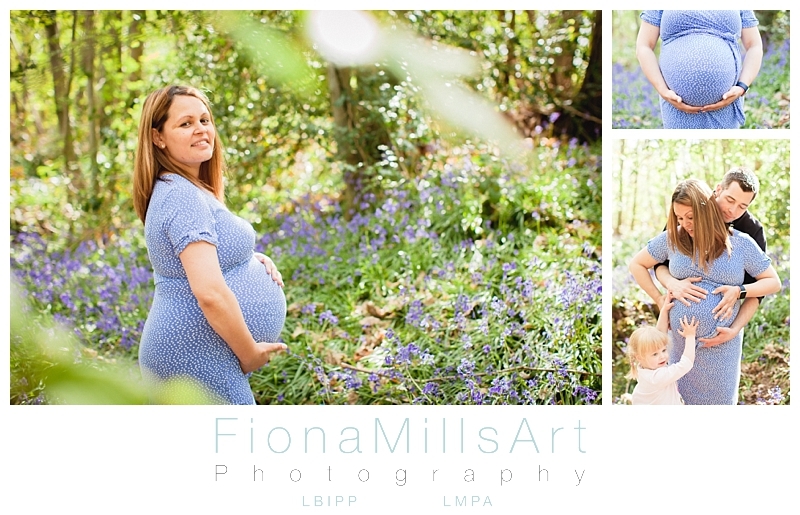 When I first got a message from Sabrina about her pregnancy and ideas for her bump to baby shoot I was most excited! 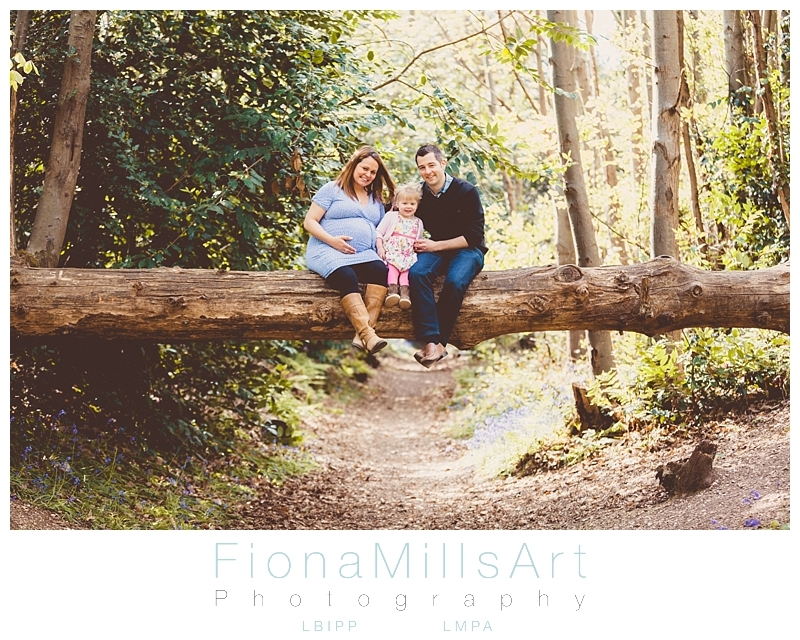 Sabrina wanted to engage in a soft, woodland theme for both sessions, tying in nature as the studio whilst including her partner Olly and their daughter, Winter. Our first stop was to research the location and discuss what props we would be using. 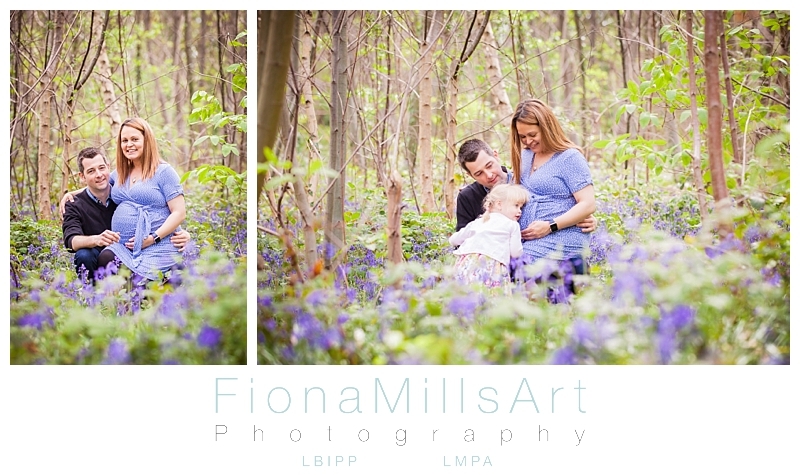 We decided on Brandyhole Copse in Chichester. 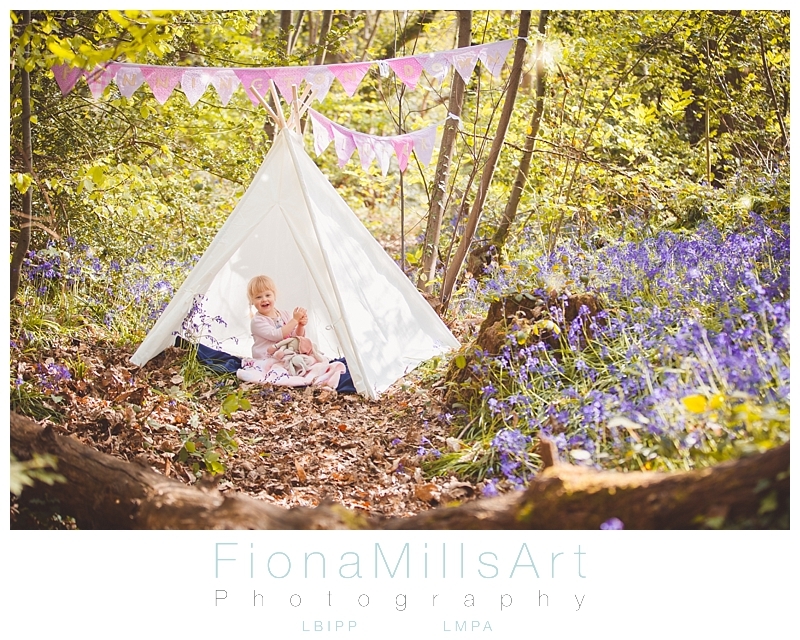 It was still in bloom with bluebells and had a variety of other foliage spots within a small area, making walking with a small child and a variety of props not too challenging! 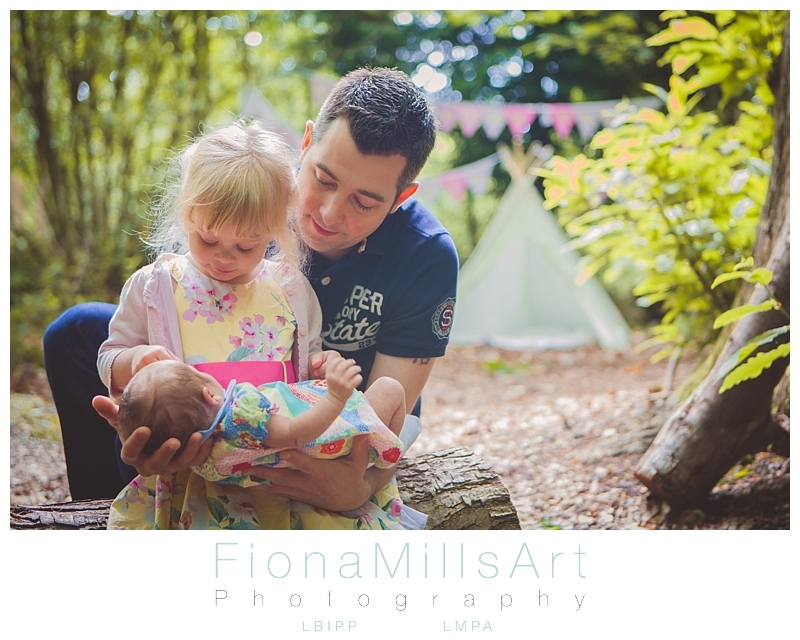 Whilst taking a moment with Sabrina and Olly, I chanced a look behind me at Winter who was making herself very comfortable on our luggage of props and photographic equipment! 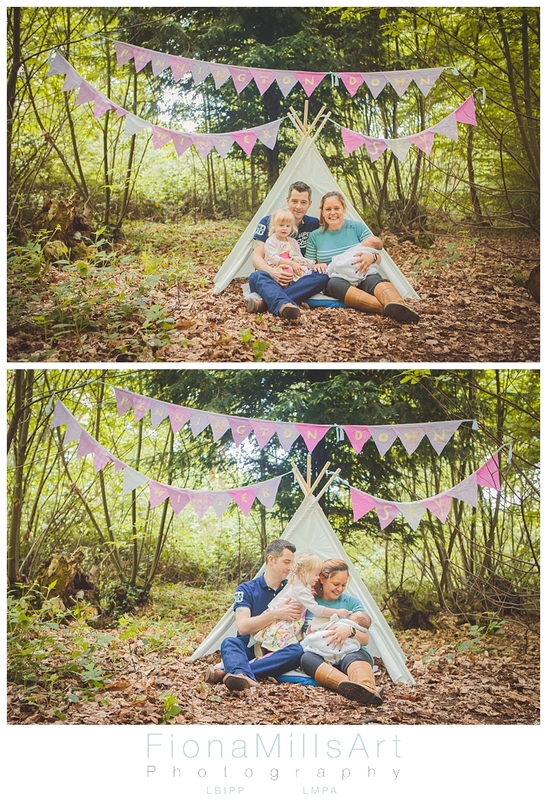 I couldn’t resist the behind the scenes shot! 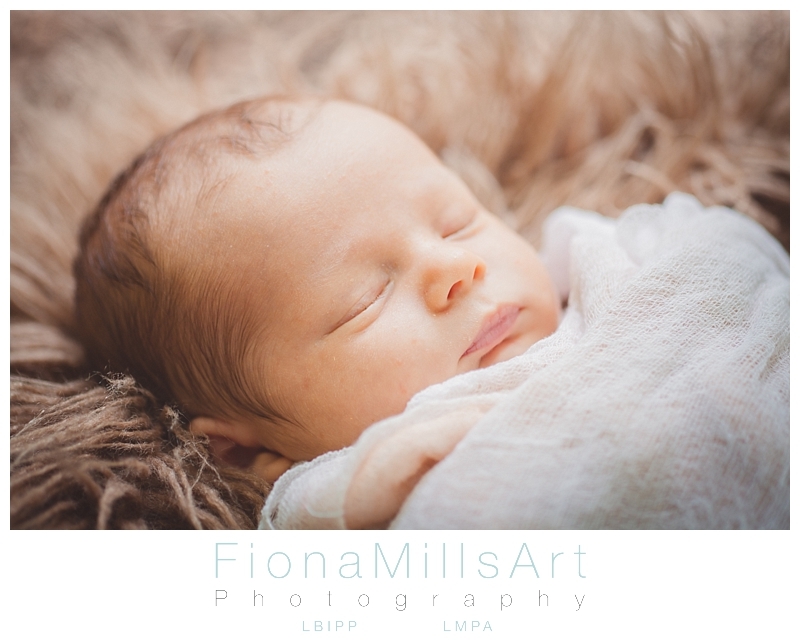 As a Chichester Bump to Baby Photographer I find myself looking around at shapes…. Natural or man made, abstract or symmetrical it doesn’t matter. I find the beauty of life around us fascinating! 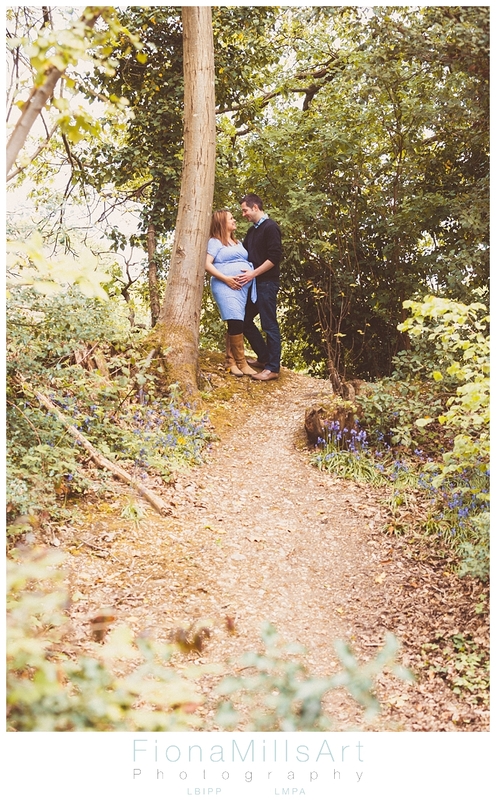 Brandyhole Copse is no exception. Nature is it’s own artist. 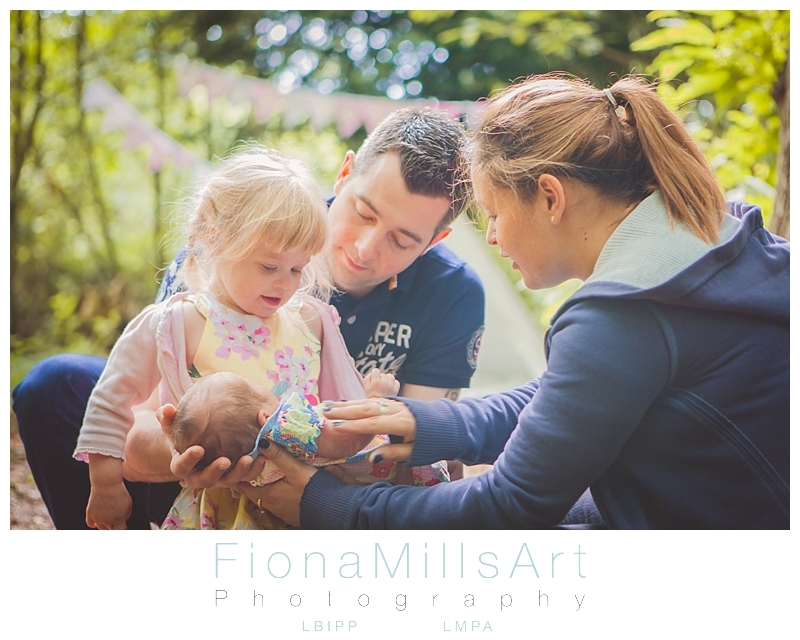 One of the reasons for planning a shoot in advance is to get an idea for what the client wants from their pictures. 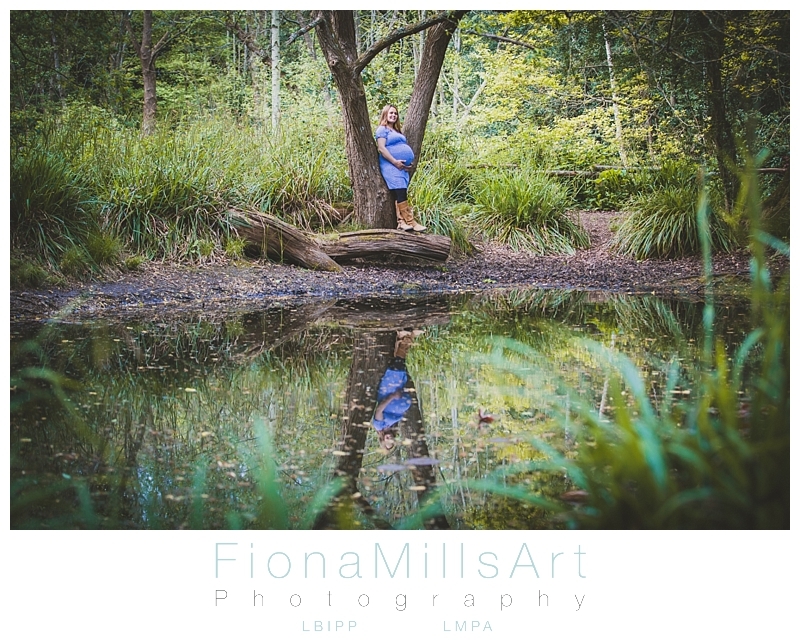 Sabrina was very open to me unleashing my creativity with her to capture the memory of her with her blossoming bump. While Winter had a cheeky chocolate break, Sabrina kindly braved the fragrant pond while I sought reflections and symmetry! 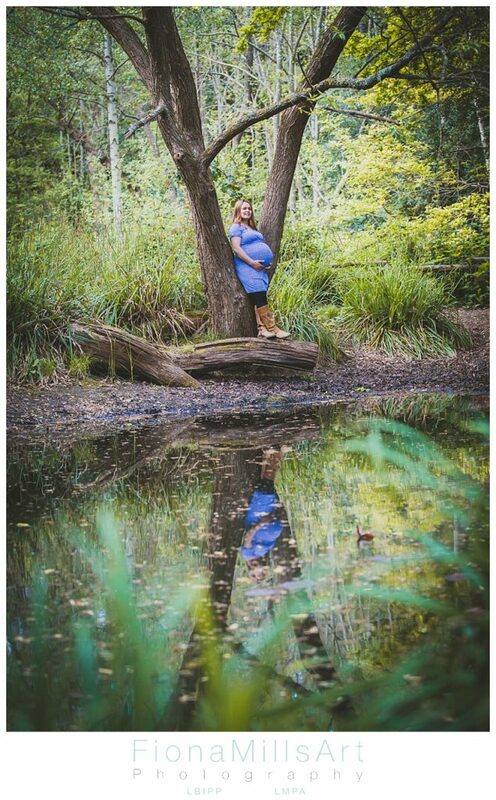 I think we may also have invented “Extreme Maternity Photography”. 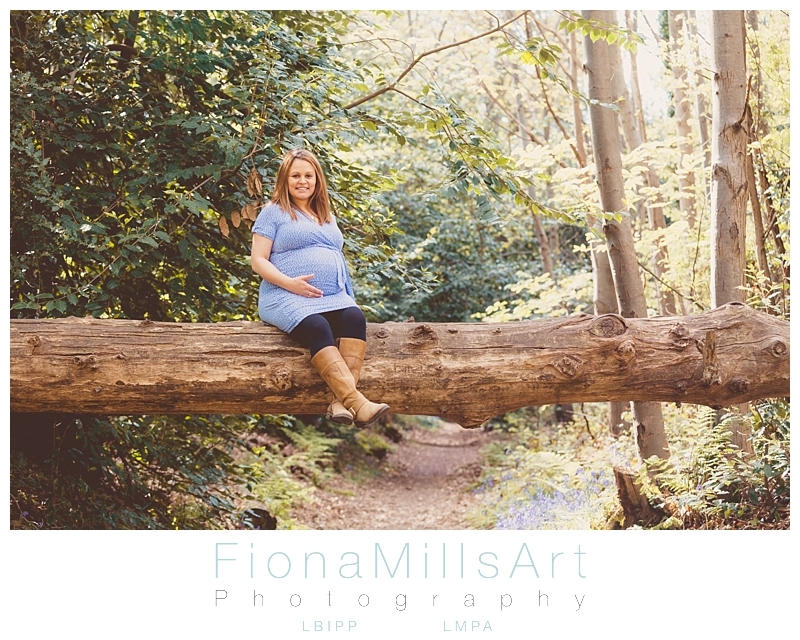 On walking around a log bridge, we all walked under, around and past this log, our conversation going from: “we shouldn’t”, “should we”, “oh no, I can’t ask a pregnant woman to do that” to “maybe, though, it could work” and “let’s do it”. 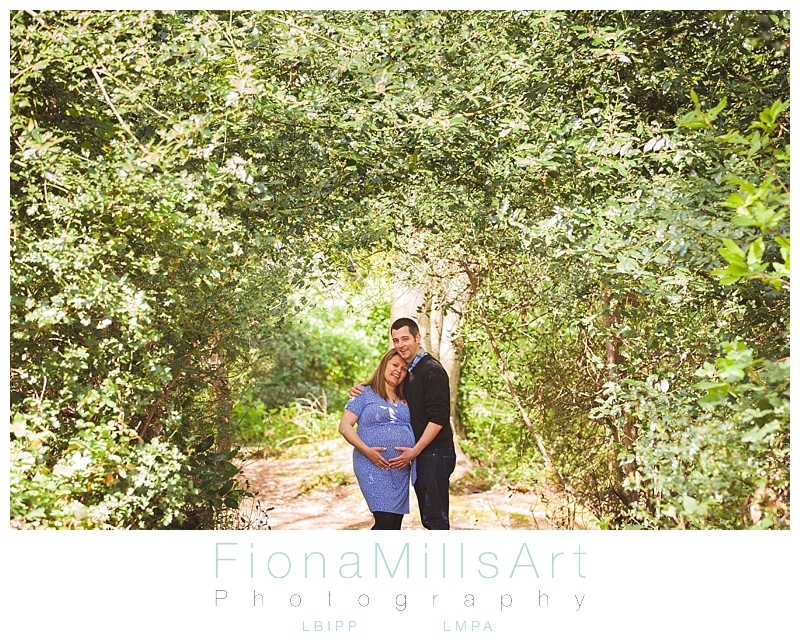 No pregnant women were harmed in the making of this shot!! 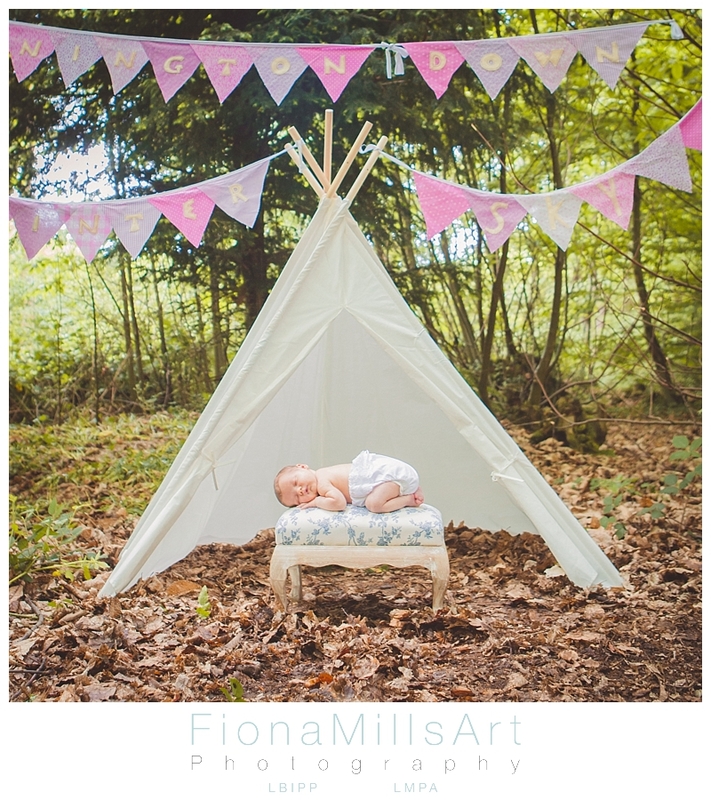 Another prop that was included for this shoot was a small teepee, bought with the intention of being used on both shoots. 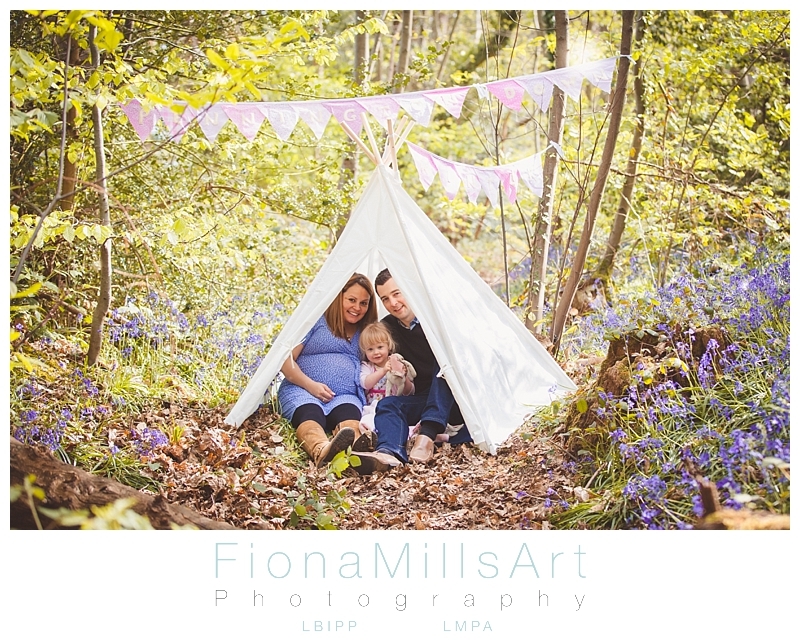 Settling Winter into her new den we embarked on the final stage of this maternity session, with the last of the bluebells and homemade bunting decorating the scene. After what seemed like a few short weeks, I was reunited with Sabrina, Olly and Winter. This time, they had Baby Sky in arms and an extra name on the bunting! 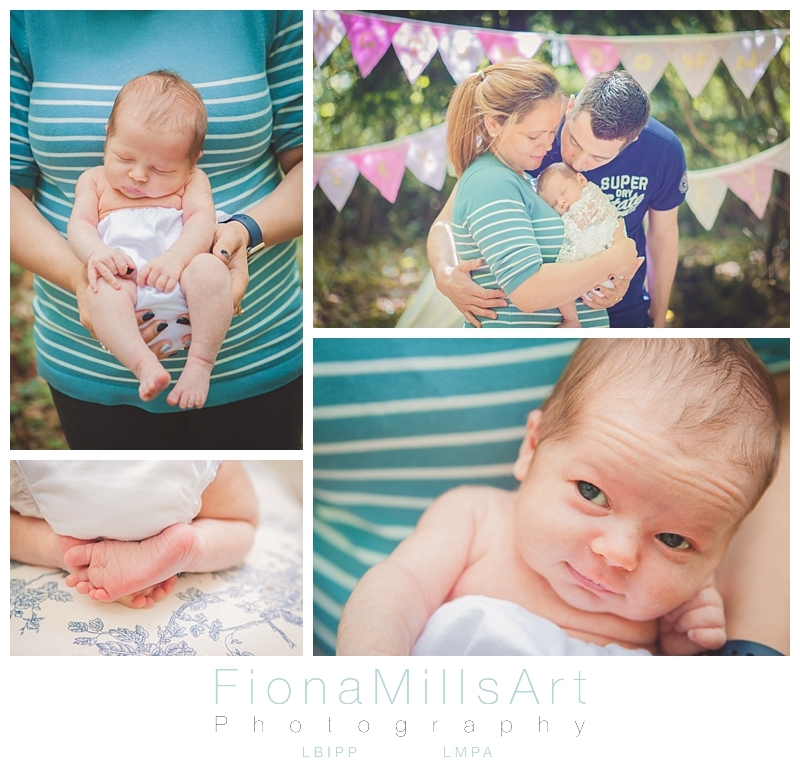 In keeping with the theme and styling of the maternity session, we embraced the changing textures of Brandyhole Copse and set about creating some newborn images of Sky, as well as some natural, lifestyle portraits of the four of them. 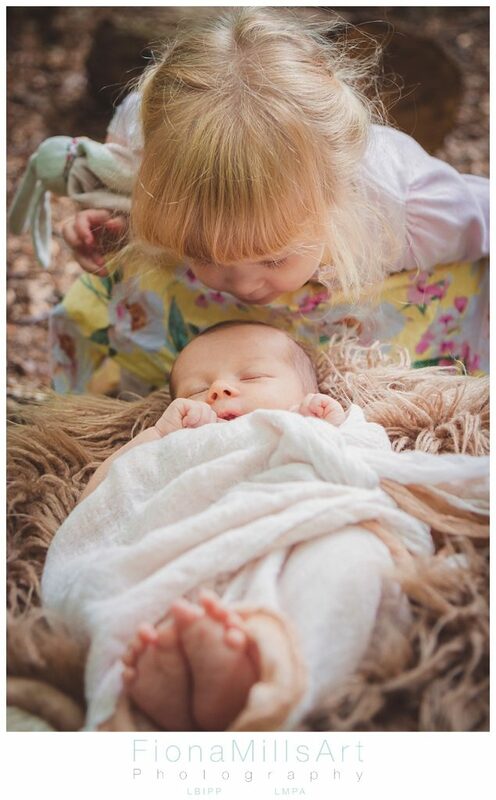 Giving Winter some time to introduce me to her baby sister was lovely. 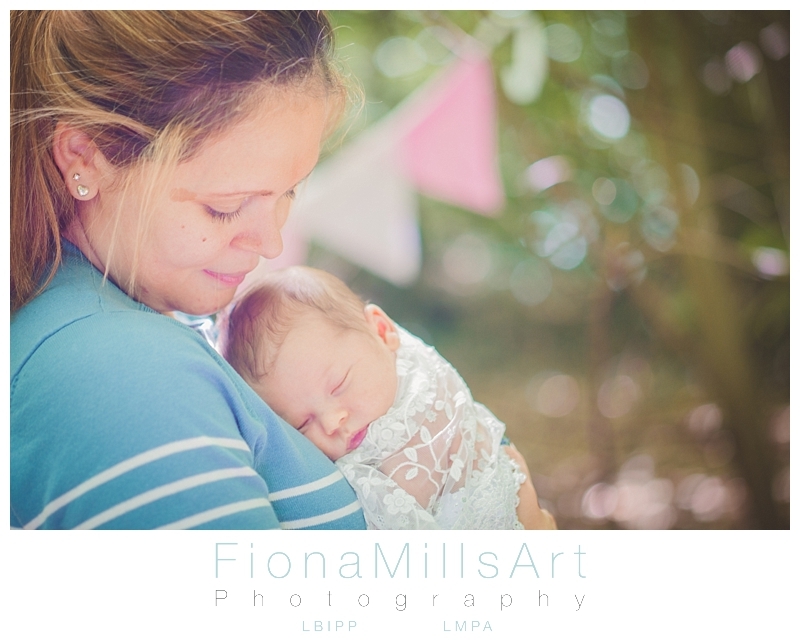 She was incredibly in to her sister, then as young children often are, easily distracted by treats and snacks in the next moment! 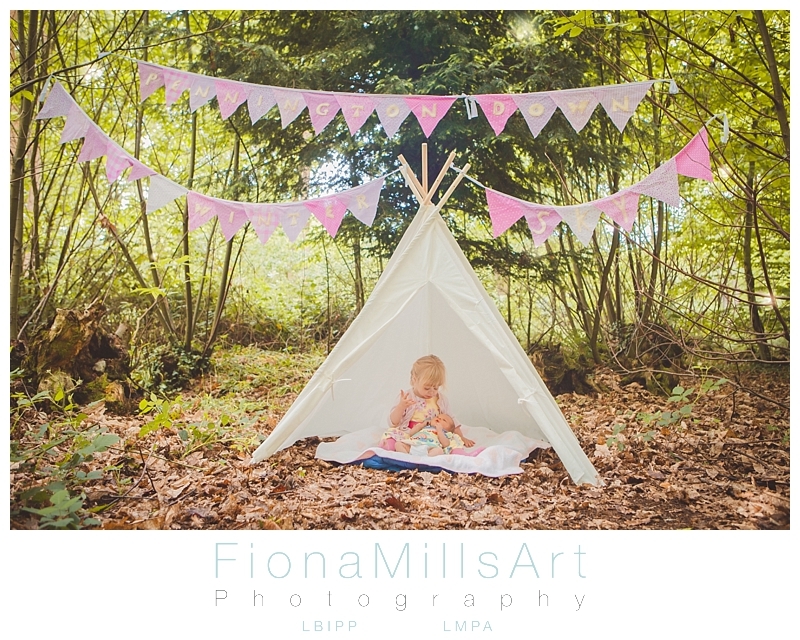 We worked with the mood of the little ones as ultimately it needs to be fun for them. Snuggles and cuddles while Sky was awake. 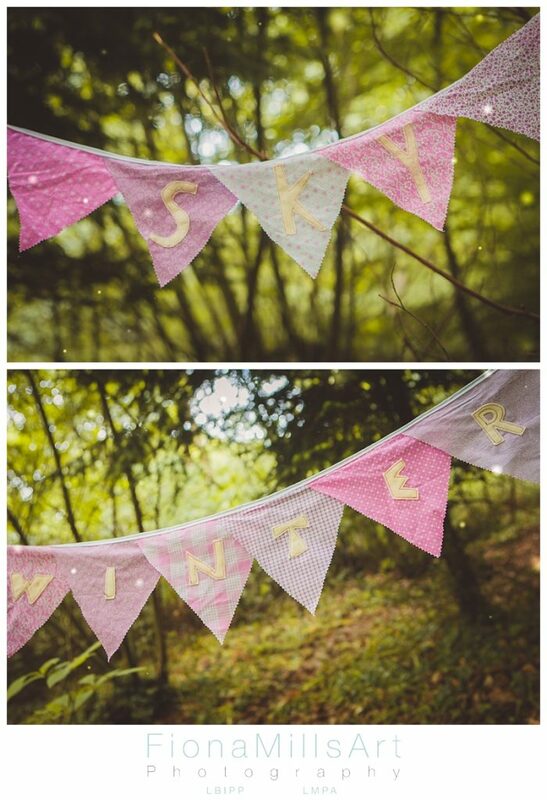 Hunting for Fairies when Winter was playful. Baskets and textures when Sky was asleep. 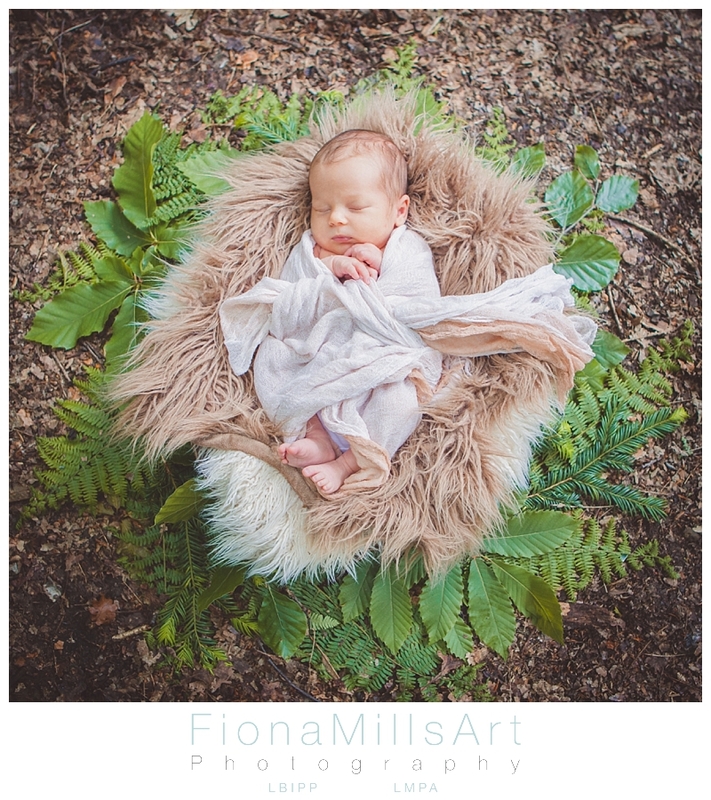 Going back to the theme of using nature as the studio, while Sky was being changed and fed I set up a basket ready to hold her. 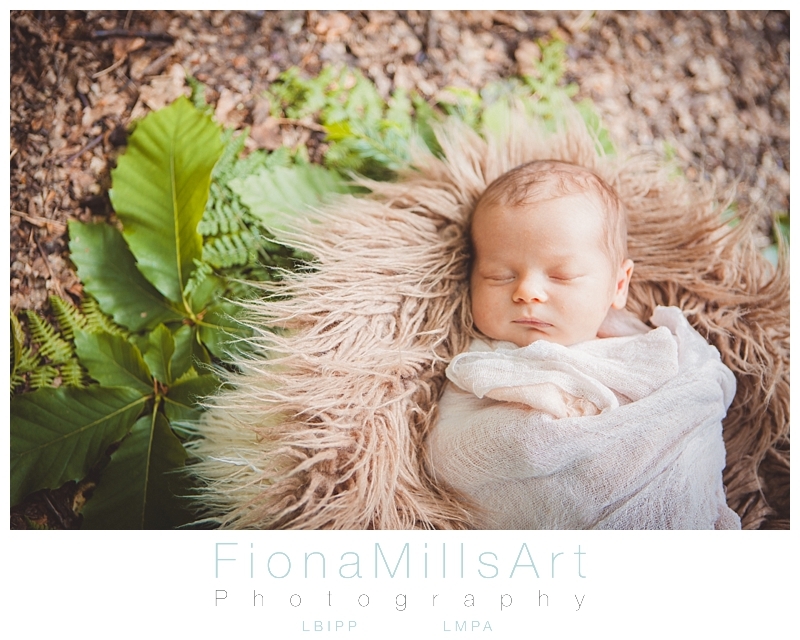 We soon discovered that Sky wasn’t a swaddler… Not in the woods on a warm day anyway! 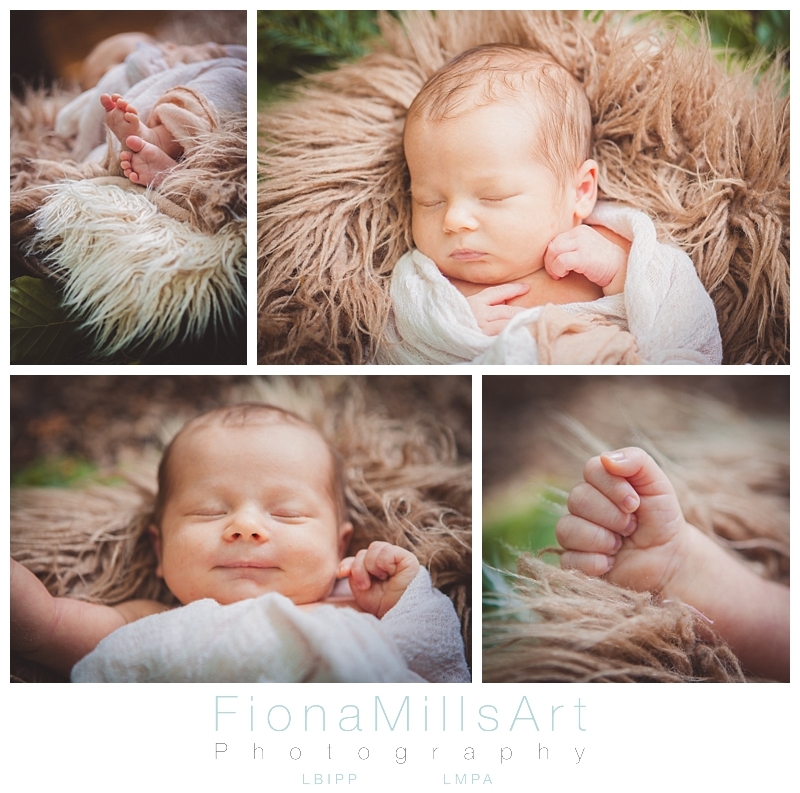 Within my role as a Chichester Bump to Baby Photographer, when working with babies, it is always my objective to work in a safe and secure manner, ensuring baby is safe from harm, comfortable and has it’s needs met. 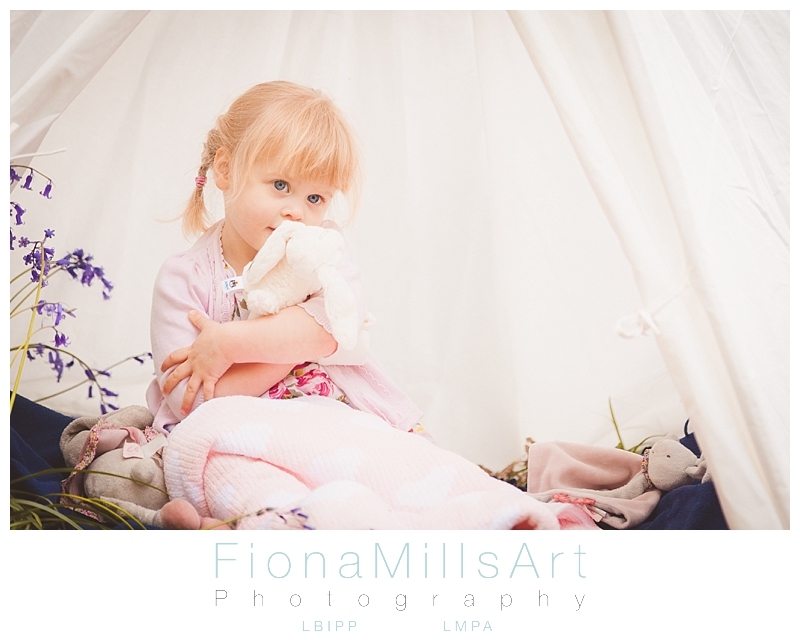 This may mean that the shoot takes longer than a normal portrait session, it may also mean that some planned shots don’t happen. It’s baby first throughout. We were very lucky that Sky was comfortable in the fresh air and snuggled into the the natural basket as planned. 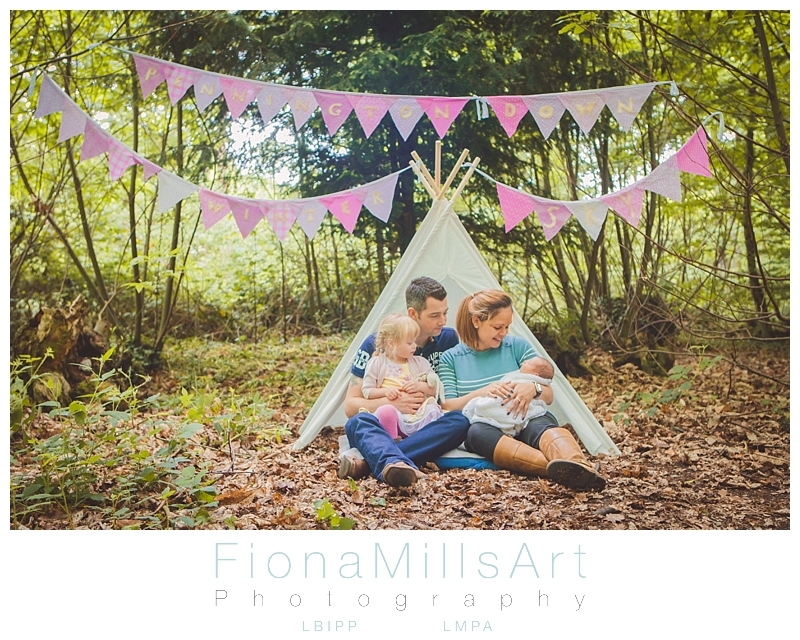 Bringing in the teepee again, we took a few moments to capture some images within it’s folds once Winter had a little nose to see what her sister was up to in her basket!